The Gauteng Department of Infrastructure Development (DID), with the assistance of the University of Johannesburg’s (UJ’s) Centre for Applied Research and Innovation in the Built Environment, is achieving unprecedented monitoring of the infrastructure development and construction projects that it is executing on behalf of the Gauteng provincial government. This has been achieved by combining digital imagery from remotely/piloted aircraft systems (drones) with 3D computer modelling and information technology systems. This results from an MoU signed between the DID and UJ in July, aimed at improving the delivery of public infrastructure by using smart technologies. “The DID, through that MoU, is also trying to introduce a new way of doing things – a government department working with a university,” highlighted Gauteng MEC for Infrastructure Development Jacob Mamabolo on announcing the significant impact achieved by the drone programme in only a few months. 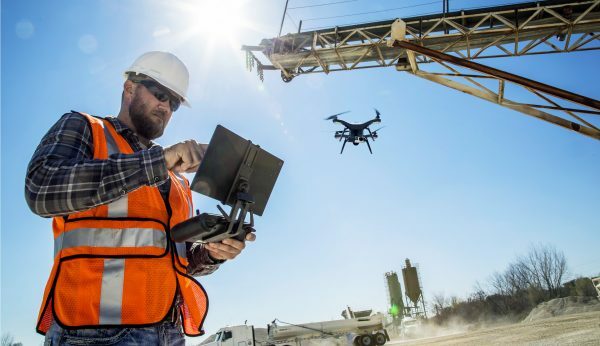 The drones are used to take hundreds of high-resolution images, time- and date-stamped and with satellite navigation system location coordinates, of projects being built or renovated under contracts awarded by the DID (usually for other provincial government departments). The 3D models created of the site are overlaid on the approved architectural drawings, and can be examined from any angle with a considerable enlargement capability.Thus any deviation from the approved plans can be rapidly identified and queried. (Such deviations are often perfectly legitimate, but now they can be queried early and, if illegitimate, reversed, instead of only being discovered when it is too late to do anything about them). The system also allows the monitoring of the delivery of materials (sand, bricks, etc) to the sites, and the calculation of the volume of such materials – all by combining drone imagery with the appropriate data processing software. This means that the DID is no longer dependent on statements made by contractors, and wastage is significantly reduced.